"With this agreement Serbia has begun to recognize Kosovo’s statehood within a legal context," said Kosovo Prime Minister Hashim Thaçi, commenting on the recent agreement reached between the Belgrade and Priština governments . The "interim" agreement foresees revenue from customs duties and taxes at Jarinje and Brnjak checkpoints on what for some remain official "administrative lines", and for others "Kosovo's borders". Revenue collected will be channelled into a special fund, allegedly established under the auspices of the European Union. After many years of stalemate, the latest agreement is just one in a series of almost spectacularly rapid and concrete results on the ground. Despite exhaustive talks between Belgrade and Priština during the government of former President Boris Tadić, the first real concrete result was apparently as early as December, when the integrated management of crossings between Kosovo and central Serbia began. This integrated crossing, conducted by Serbian state police (MUP) and Kosovo police, for the time being is unfolding separately and relatively quickly on the ground, with casual control of passengers. In most cases, only the drivers are controlled. Two partners unimaginable until yesterday, the Serbian and the Kosovo police, have met in the buffer zone. Their former checkpoints, now abandoned, appear spooky, increasing the risk for traffic safety. The citizens of northern Kosovo, however, see these fast and efficient talks, which are strongly supported by leading Western leaders, as well as the Belgrade government, as grand treason. The biggest shock, for the citizens of northern Kosovo, lies in the fact that the peaceful integration of northern Kosovo into the Kosovo system is being carried out by the current Prime Minister of Serbia, Ivica Dačić, the leader of the political party that in 1999 decided to enter an armed conflict with the greatest world power for no other reason than the defence of Serbian sovereignty over Kosovo. The shock is hardly softened by the supportive role of the seemingly anaemic Serbian president, Tomislav Nikolić, who, as head of the party which sprang from the most radical party in Serbia, only a few months earlier, based his election campaign on messages to the citizens about defence of sovereignty. Thus, he told the citizens of northern Mitrovica gathered in the central square during his campaign, that he would "undo all the previous negotiations" of the government at that time that are to the detriment of Serbs from Kosovo. "Despite everything that we went through during the last thirteen years, and longer, the most painful and humiliating fact for the citizens of northern Kosovo is that all the efforts we made to stay within the institutions of Serbia are now being taken away from us by Serbia, and most tragic of all is that with his express negotiations and results, Prime Minister Dačić has just taken away our most powerful weapon, civil disobedience in order to resist the imposition of an integration into a system that Serbs in the north do not want," says local businessman Goran F. (37) from the Banjaska suburb in northern Kosovo. It is the recent statement of Serbian Prime Minister Dačić regarding "the parallelism of institutions in northern Kosovo", and his announcement of negotiations regarding these institutions, that have convinced the citizens of northern Kosovo that Belgrade has finally caved into years of pressure from the West that Serbian State institutions in the north must be dismantled, and that Belgrade actually accepts the Ahtisaari plan, no matter what the negotiators call it upon returning from Brussels. "People did not fight thirteen years for Serbian institutions in Kosovo, as Prime Minister Dačić defines the future of Serbs in the north, but for keeping the system in which generations before us lived, and in which our children live today. The sovereignty of Serbia that Dačić talks about when he comes back from Brussels to Belgrade is something we in northern Kosovo will experiment in the near future through the imposition of what we have resisted against for thirteen years," said Nevenka Medić (48), a citizen of North Mitrovica. From the July crisis, when the government, with the support of the opposition, which is now the current government, stood with the citizens of northern Kosovo on the barricades, through the repentant change of course on the part of Belgrade, to the present express negotiations of Prime Minister Dačić, citizens bitterly remember the fate of Bosnian and Croatian Serbs, ironically noting that, once again, a part of the Serbian nation is facing many years of disastrous policy of the Socialist Party. "Whenever the SPS (Socialist Party of Serbia) has conducted negotiations, the result of those negotiations have been new borders, new humiliation, new pain and suffering, and now, for the first time, the reduction of the very territory of the Republic of Serbia. What's next?”, says elderly Sreto Lazić, by his own admission "an eternal foe of the SPS Commies". Following the inertia of communicating vessels, the beginning of the resolution of the problem of northern Kosovo, like many times in the past, has inevitably spilled over into the sensitive part of southern Serbia and the municipalities with an Albanian majority population in this area. The recent removal of a monument in Preševo to the fallen members of a paramilitary organization called the Liberation Army of Preševo, Bujanovac and Medvedja, following extremely delicate negotiations between Belgrade officials and the Albanian leaders of these municipalities, provoked an eruption of violence against the tombstones of Serbs in southern Kosovo, which has been condemned by all international officials in Priština and by the Kosovo government itself. Cemeteries and monuments in a dozen villages and municipalities where a few Serbs remain have been damaged. In Vitina, for example, even a monument erected to the fallen soldiers against the Fascists in World War II was destroyed. Footage of the demolition of this monument has appeared on YouTube. The footage shows that the event was followed by an applause from many who were present, among whom there were also members of the Kosovo police. Earlier, in the Serbian village of Gorazdevac, in Metohija, a monument to the victims of the NATO bombing and to Serbian children swimming in the river who were killed in an ambush in 2003 by rounds of automatic rifle fire has been vandalized. A monument in the cemetery of the village of Prilužje was also blown up, and the crosses on the grave markers set on fire. The fate of the Serbs in the south and the north of Kosovo appears different. 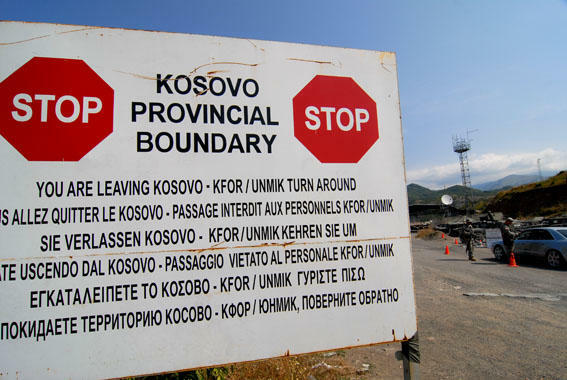 Despite the integration of south Serbs into Kosovo institutions, they are still linked, however, by the same institutions of the Republic of Serbia, which exist in both the south and in the north of Kosovo, although all parties remain silent about the existence of these institutions south of the Ibar. They are also linked by the continuing trend among south Serbs during the past thirteen years to seek real refuge in the north, buying real estate, investing in private business and sending their children to school. At the same time, more and more Serbs from northern Kosovo have lately turned towards central Serbia, doing the same as their compatriots from the south. "If this continues, there will be a peaceful integration into the Kosovo system. It will be noted that the Serbs from the north integrated when, in fact, we have been suppressed by everyone, Belgrade, Priština, the Serbs coming from the south who have already integrated themselves into all systems". This is a typical sentence that can be heard more and more often among the embittered citizens of North Mitrovica, as they wait for new rounds of talks on the “parallelism" of institutions, "liaison officers" and the finalization of the implementation of an integrated management of the crossing system.